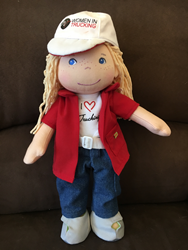 Women In Trucking Association, Inc. launches its new plush doll, Clare, developed and produced by HABA to encourage young girls and women to enter the transportation industry. This release applies to women, gender diversity, trucking, transportation, logistics, supply chain, business, leadership, female empowerment, non-profit. The launch of this doll is a long-time dream come true for me. The world is wide open for girls today and I'm thrilled to be providing a toy that tells them that whatever they want to be is just great - whether that's a teacher or an ad exec or a professional driver." The future's an endless highway for girls around the U.S. playing with a brand new plush doll developed and produced by HABA for the Women In Trucking Association, Inc.
Clare, a passionate and energetic plush friend, stands 13" tall and features an official Women in Trucking cap atop a wind-blown blond head of hair. This driven young lady also comes with an "I Heart Trucking" tee, red collar shirt, jeans, and boots. Her package shares the story of her journey into the driver's seat of her very own 18-wheeler. The doll is the brainchild of Ellen Voie, founder and CEO of Women In Trucking, a nonprofit group that encourages the employment of women in the trucking industry. The release of this somewhat non-traditional new toy couldn't be more in line with the current political climate of female empowerment. Says Voie, "The launch of this doll is a long-time dream come true for me. The world is wide open for girls today and I'm thrilled to be providing a toy that tells them that whatever they want to be is just great - whether that's a teacher or an ad exec or a professional driver." A coincidental meeting helped Clare hit the road - Voie bumped into Lea Culliton, President of HABA USA, a preeminent toy manufacturer, in an airline lounge. The two talked and agreed to partner, with a sponsorship from the National Transportation Center to offset some of the production costs. This spunky trekker will also star in this summer's "I HEART Trucking" Photo Contest, themed "Clare's First Road Trip!". Professional drivers across the country will be submitting photos from the road, featuring Clare, and the winner will be recognized at an "I HEART Trucking" reception at the Great American Trucking Show in Dallas, TX, in August and be featured in Redefining the Road, the Women In Trucking Association's magazine. Clare will be available at Travel Centers including TA/Petro Stopping Centers, and others, across the country beginning in March. Parents and gift givers can also purchase the doll on Amazon and at http://www.HABAUSA.com. Women In Trucking Association, Inc. is a nonprofit association established to encourage the employment of women in the trucking industry, promote their accomplishments and minimize obstacles faced by women working in the trucking industry. Membership is not limited to women, as 17 percent of its members are men who support the mission. Follow WIT on Twitter, Facebook, or LinkedIn. For more information, visit http://www.womenintrucking.org. Bring home Europe's very best with HABA USA, the high-quality brand that parents have trusted for more than 75 years! HABA USA fuses time-tested play patterns with European design and modern manufacturing processes to create their award-winning line of wooden toys and games. From toy cars and trains to building blocks and pretend play props, HABA USA's line of classic, non-electronic toys and games has something (stylish!) for everyone. Join generations of children around the world who have to have their HABA! For more information visit http://www.HABAUSA.com.